Announced during the summer of 2013 several months, the Samsung Galaxy NX shares some of the familiar styling of the earlier NX20 yet with an elongated body to accommodate an enormous 4.8” 1280 x 720 (921k-dot) LCD. 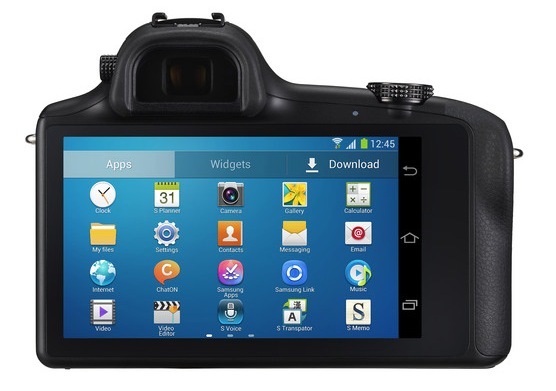 As a Galaxy model, the large touchscreen is of course aimed at replicating that found on a smartphone, as the Galaxy NX is the first camera with interchangeable lenses to feature the Android operating system. As a result the body has few controls with nearly all the functions accessed and controlled by the rear panel. In addition to the 20.3-Mpix APS-C sensor with its Hybrid AF system comprising of 105 on-chip phase detection AF pixels and 247 contrast detection points, the camera has a rather impressive spec including, a 1/6000th sec shortest shutter speed with a 1/180th sec sync and 8.6 fps burst capability. In addition to the rear panel it has a 480k-dot resolution 0.46” EVF with focus peaking but the standout features have to be the camera’s cellular functions. Running Android 4.2 (Jelly Bean) the NX has an extensive range of connectivity options including 3G/4G LTE, dual band 2.4+5 GHz Wi-Fi (with NFC), Bluetooth and built-in GPS. Mirrorless cameras are of course well suited to video capture and the Galaxy NX has the usual 1080p at 30/25fps (NTSC/PAL) as well as 1920 x 810 24fps and a slow-motion 720/60/50fps options, though it doesn’t quite match the later NX30’s additional spec with uncompressed output via HDMI. Unusually this camera shuns the ubiquitous SD card form factor and adopts the tiny micro SD alongside a SIM card instead. The larger screen real-estate means the Galaxy NX is somewhat bulkier than others in the line up at 5.4 x 4.0 x 1.0″ / 136.5 x 101.2 x 25.7 mm yet it remains relatively light in weight at 1.09 lb / 495 g with battery. 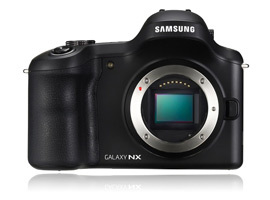 The Galaxy NX is available now at $1,249 including the Samsung 18-55mm f/3.5-5.6 OIS (stabilized) zoom lens. 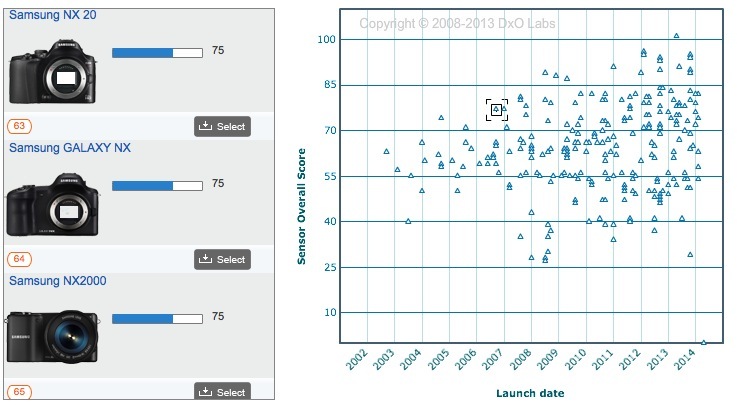 The Galaxy NX is ranked in 64th place overall with it achieving a DxOMark score of 75 points. 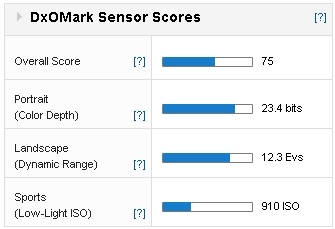 This places it alongside the Samsung NX20, NX300 and later NX30, but slightly behind the current Sony NEX and Alpha models such as the A3000 or the SLT Alpha 77 both with DxOMark scores of 78 points. Few could argue that the Samsung Galaxy NX isn’t an intriguing proposition though just how many are likely to fully exploit the camera’s mobile features (bearing in mind the obligatory cellular providers’ tariff) is yet to be seen. 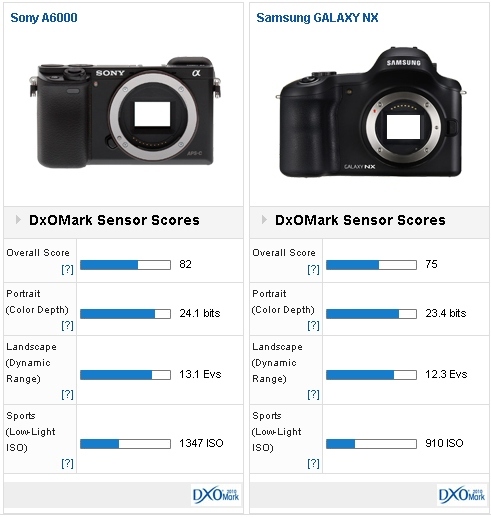 As for sensor performance, however, the Galaxy NX shares the same 20.3-Mpix CMOS device as found on the NX300 and the NX30. If you’re not enticed by the 4.8” screen and the additional capabilities that the Android OS imparts, then either of those two more modestly models may well be more suitable.